I find puzzling that "third world socialism" is espoused by people who are deeply themselves un-socialistic. Sure, one can be cynical, but why do they mouth formulas which their lives contradict? 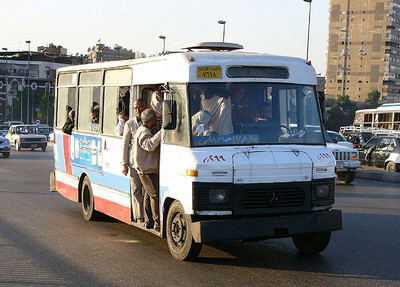 A Cairene bus with the usual overload. In Egypt, where I am living, the degree of class differentiation and privilege is shocking to a Western sensibility. Even the city busses have two classes! This results from a range of skills far wider than anything that exists in the West. If you're li­terate, you're in the minority, if you make over $100 a month, you're rich. Since so many Egyptians lack skills or money, a tremendous pool of surplus people perform services for very little. They have no chance at all of rising for they lack the basic tools for skilled jobs—such as writing. It is great fun for those can to take advantage of their existence. Egypt has basically three different classes. The very rich and the rather rich who feel themselves to be displaced Westerners and float on a sea of services. The middling rich-poor who struggle to do all right, wear Masri-suits, can batter they way through foreign languages, and feel superior to the vast masses of poor. Finally come the vast masses of the poor, the overwhelmingly dominant part of the population who form only a very small part of its consciousness. Stuffed into the back of busses and living in wretched housing, they scrape for a few piasters. The first and second classes run the country, and especially the first. Yet they are the ones sounding off about socialism, they who (far more than their Western, non-socialist, peers) live off the fat of privilege. To complete the irony, I (an arch capitalist) feel socialistic urges when I see these people. I am disgusted by their ar­rogance, their veneer of privilege, their fastidiousness. They provoke a strong feeling of antagonism; I should love to pull them down, dress them in galabiyas, and sent them off to the Husayniya district of Cairo to live for a good while. Yes, Egypt needs socialism, and it is those who call for it who deserve to be its victims.